NEW YORK (CNNMoney) -- A 3D food printer sounds like something out of Star Trek, but it's not out of this world. It's up and running at the French Culinary Institute in Manhattan -- and in five years, it could be in your home. As part of a project at Cornell University, a group of scientists and students built a 3D printer and began testing it out with food. The device attaches to a computer, which works as the "brain" behind the technology. It doesn't look like a traditional printer; it's more like an industrial fabrication machine. Users load up the printer's syringes with raw food -- anything with a liquid consistency, like soft chocolate, will work. The ingredient-filled syringes will then "print" icing on a cupcake. Or it'll print something more novel (i.e., terrifying) -- like domes of turkey on a cutting board. "You hand [the computer] three bits of info: a shape that you want, a description of how that shape can be made, and a description of how that material that you want to print with works," says Jeff Lipton, a Cornell grad student working on the project. Lipton is pursuing a Ph.D. in mechanical engineering. The project came out of Cornell's Fab@Home venture, headed up by associate professor Hod Lipson. Started in 2005, the project aims to create do-it-yourself versions of machines that can manufacture custom objects on-demand. The group started experimenting with food fabrication in 2007. Lipton thinks food printing will be "the killer app" of 3D printing. Just like video games fueled demand for personal computers 30 years ago, he thinks the lure of feeding Grandma's cookie recipe into a printer will help personal fabricators expand beyond the geek crowd. "It's really going to be the next phase of the digital revolution," he says. David Arnold, director of culinary technology at the French Culinary Institute, has been testing out the technology since October 2009. He loves the experimentation it makes possible. "One of the main things I hope this machine will let us do is create new textures that we couldn't get otherwise," he says. "This is the first time I've really seen this happen." That could draw in chefs and restaurateurs. But Arnold also thinks a 3D food printer will have mass appeal. "This would be a slam dunk for cookies at holiday time," he says. "Anything that requires a high level of precision that people don't usually have with their hands, in terms of making icing or decorations, this thing can perform amazingly well." 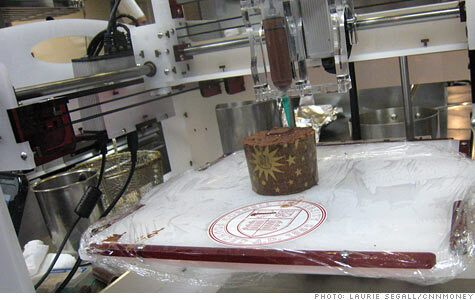 Because it's an academic project, the 3D food printer isn't commercially available -- yet. The Fab@Home project has the blueprints for free online, and dedicated hobbyists can use them to build their own. One retailer, nextfabstore.com, offers an assembled version for sale -- starting at a mere $3,300. Entrepreneur Jamil Yosefzai plans to be on the forefront of commercializing the technology. His New York City-based startup, Essential Dynamics, is working on a version that can be sold to the first wave potential customers: pastry chefs and tech early adopters. Yosefzai thinks his version of the printer will kinetically retail for around $1,000, but he expects that price tag to eventually fall to $700 or so. And he predicts that the technology could become a household staple within a decade. "It comes down to comfort level, and that will expand as the [technology] goes more and more into schools and everywhere else," he says. "Sort of like computers -- the kids picked it up first, then the parents picked it up, and once everybody has an acclimation to it, they'll be printing left and right."